1993, Hubcap used, 15", 66, BUICK, LESABRE, RIB TYPE, CHROME OUTER RING, 40 SLOTS PAINTED BLACK WITH OPEN SLOT AT END, RAISED CENTER WITH THREE FLAG COLORED LOGO, METAL CLIPS. 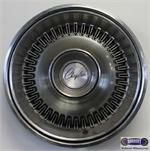 1994, Hubcap used, 15", 66, BUICK, ELECTRA, LESABRE, 40 SLOT TYPE. 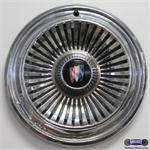 377, HUBCAP USED, 15", 74-76, CHRYSLER, PASSENGER, (RWD), CHROME OUTER RING, POLISHED WITH 40 SLOT TYPE, WITH RECEDED CHRYSLER LOGO. & METAL CLIPS.